On friday my friend Elke (Love Like Birds) is playing in Utrecht. Last week she played in Amsterdam and it was great seeing her. We lived in the same city twice in our lives (Amsterdam and then Gothenburg) and I really miss having her around, but it's great that I get to see her twice in one week now. It's going really well for her music career and she really deserves it. 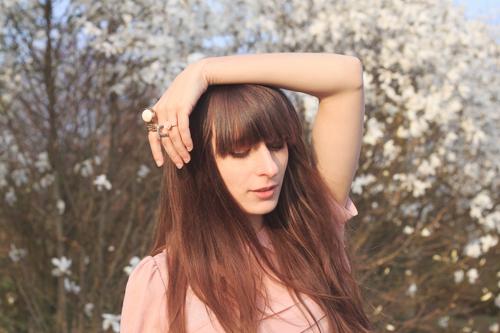 This week she's playing support for Dark Dark Dark at Bush Hall in London (04/04) and Ekko in Utrecht (06/04) so go and see her if you have the chance! Ben nog steeds instant in love met die heels! You look really cute and your friend.. she is amazing I gonna check her music, thank you for sharing! Really sweet and whimsical outfit. You look lovely. Bloemen op de achtergrond! En wat een lieve top is dat! Love the outfit! Soooo cute! lovely supershoes uiteraard en ik heb echt een supercrush op je ringen. amazing! love this look- the peter pan collar is so cute and your friend's sone is sooo amazing! she is beyond great! Thats so cute sweets, love your blog! Gorgeous top, both the shade and the design. I love the look. you look so cute in that peach top! I love your collared/tiered blouse! So cute, I've been searching for one like it for a while. Your outfit is amazing, I love it! Your blog is amazing, I love it! I'll be following and checking back often! I have a Topshop top identical to that one and I was never sure how to wear it. Thanks for the inspiration!